LikeMe module is a Tinder-like add-on that lets site members like or skip each other. In case there is a match, they can communicate directly on the site. Members photos are displayed according to a person’s ‘looking for’ settings and partner age range that they indicate in their profile. Module settings are located in the admin panel > Modules > LikeMe. Play local option centers around user’s own location (country, region, city). If disabled, the module will display all site members who meet the gender and age criteria, who have not activated stealth mode, and whose profiles are active. Action when there is a LikeMe match decides which of the communication tools will be available to the site members who matched. It can be an IM chat, sending a message through mailbox, etc. 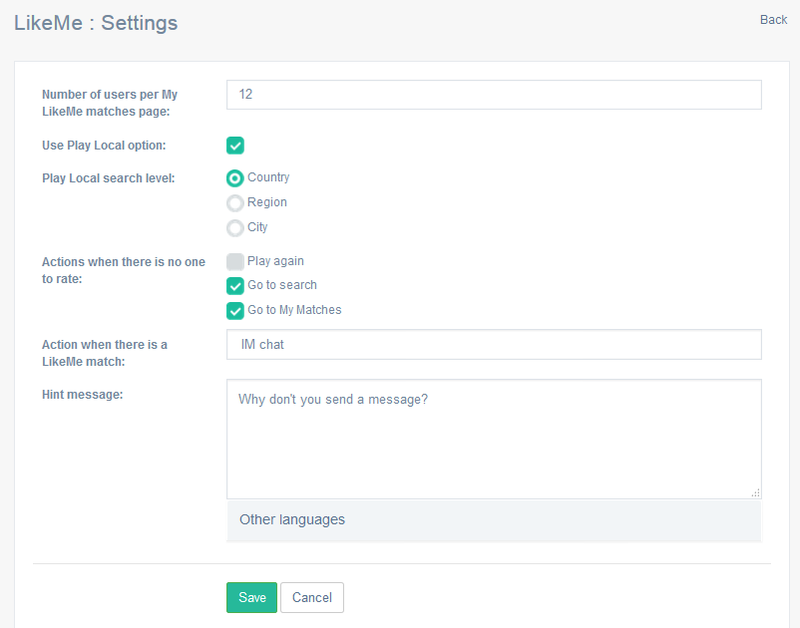 The list of available communication options is comprised of the site modules that allow this or that type of communication on the site, that are installed and active. Actions when there is no one to rate will give further options to the participants to encourage them to spend more time on your dating site.